Just when we were getting used to spring sunshine and temperatures in the 50’s Mother Nature shows us again that she’s in charge and she’s not quite done with winter weather. We’re currently in the midst of a good soaking rain and under a WINTER STORM WARNING starting tonight, primarily for elevations above 5,000 feet where 6-12 inches of new snow is expected. We won’t see that here but we’re bracing for a cold, wet snowy day on the water tomorrow. Lucky for you we’ve got plenty of Simms cold weather gear still hanging around the shop and better yet it’s all 30 percent off! And speaking of SIMMS – spring is definitely wader weather and there are no better waders in the world than Simms waders so if you’re in the market for a new pair we’d love to sell them to you. We stock G3’s, Freestones and Tributaries (something in every price range) and the boots to go with them and we’re happy to order absolutely anything else you might want including boot foot models or G4’s or G4Z’s, which are the ultimate in wader technology and quality. It’s a busy week here at WCA in spite of the soggy weather. The west side blew out Sunday night bringing an influx of guides and outfitters and their clients in search of fishable water and it just so happens the Missouri fits the bill and we’re happy to host the migration. The river is fishing well, with the majority of traffic in the Holter Dam to Craig stretch. LPP and the Dearborn are adding some color but not so much that it’s having a negative impact on the fishing. Most are opting to fish the clean side but don’t be afraid to work the mud line with a worm and a sow bug or better yet a streamer if you are so inclined. In my mind there is no better time to fish streamers on the MO than April and these soggy/cloudy/snowy days can be lights out. Sparkle Minnows, MK Ultras or Ultralites, Mojo minnows, Clousers, Skiddish Smolts…..angler’s choice this time of year. Fish what you like and stick with it. Nymphing the dam down is your best bet for numbers. The aforementioned worm and sow bug are key. Pill poppers, UV Crush, Caviar Scuds, Lucent Bead Rays, Soft Hackle Sows, Pinkalicious, Rainbow Czechs, Bubble Yums, Cotton Candies, Amex…..all good choices. The water is still on the cold side at right around 37 degrees so the majority of the fish are continuing to hold in the deeper, slower water but we’ve picked plenty up in the transitional water as well so don’t limit your options. 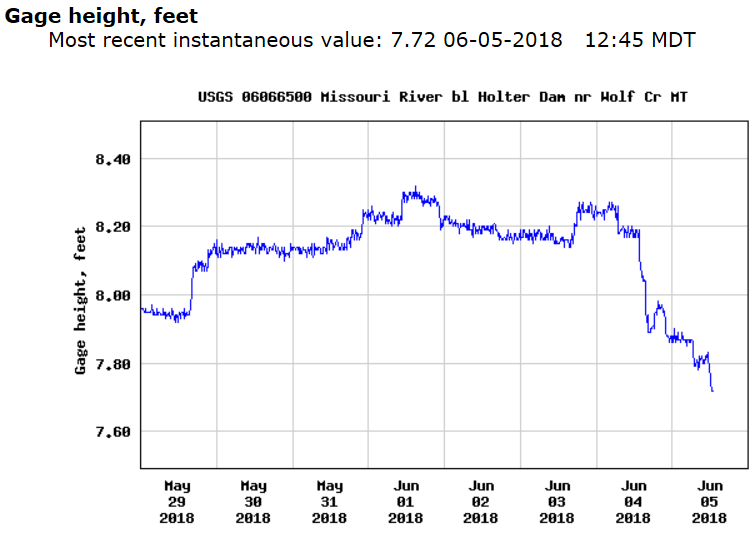 Flows have bumped to the 6500 range….we love 6-8K and the river does too. The Missouri River awakening continues this week as Izaak’s opens on Thursday, April 11th for season number nine. We can’t wait! Brisket Sandwich and Smoked Wings oh how I’ve missed you. Izaak’s will be closed on Mondays and Tuesdays for the time being but open for divinely delicious dinner offerings Wednesday-Sunday 4 PM – 9 PM. 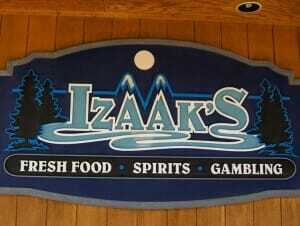 Dinner at Izaak’s is a highlight of the trip for many and we are thrilled to have this world-class dining option here on the Missouri. It’s going to be a soggy week here on the MO but it looks like we’ll see a return to more seasonable conditions by the weekend. We’ve got lodging available for the weekend ($99 for a kitchenette, $75-$85 for non-kitchen rooms) and our $400 spring special guide trips are in full swing. Book yours today! For whatever reason I haven’t fished the Missouri much these past few weeks, save a couple of short walk in outings. December is definitely the slowest month traffic wise on the Missouri but it’s not because it doesn’t fish. The short cold days of December find many busy with the holidays and for a lot of guides, outfitters and shop owners December truly is the end of the season which means it’s time to catch up on end-of-the year paperwork and other such unfishy things. Counting flies, completing and submitting outfitter logs and begging folks to come out and deplete shop inventory are a few things I’ve been doing. A lot of guides have winter jobs which are typically in full swing by now so we just don’t see much activity during the month of December. Once the holidays have passed cabin fever starts to set in and a break in the weather will typically bring them out in droves but for now all is quiet. While looking at the unseasonably warm forecast for this week I decided I really needed to get back on the water. So far this winter most of my days off have coincided with cold temps, wind, domestic projects, lethargy or all of the above. On the days I’ve thought about fishing the weather has changed my mind but with a few winter trips coming up and a fish shaped hole in my constitution I decided Monday was the day. WCA/Iron Fly guide Brad Turner and I battled a bit of wind but for the most part had very mild weather, at least by December standards. We skipped the dam and opted for the Wolf Creek Bridge to Stickney run intent on devoting a good part of the day to streamer fishing. Winter water and winter nymphs are producing though it certainly wasn’t lights out. A half-hearted effort perhaps but we were content to pick up a few fish just to affirm the water and bug selection prior to moving on to the big bugs. Winter is the season of status quo as far as nymphing goes. Rainbow Czechs, Pink Amex, Pill Poppers, Rainbow Weight flies, Tailwater sows, black Zebra midges, Soft Hackle Sows, Firebead anything, UV Crush, Bubble Yums, Cotton Candies, Pinkalicious, Yum Yums, Pink Lucent Bead Rays….you know the drill. Whatever you do adjust depth and weight before getting carried away with changing bugs. You can often run the same bugs for weeks at a time. Seeing as we were mostly interested in streamer fishing we soon switched rigs and had good action from the start with Brad picking up a nice bow and a good brown within the first mile of water. Things slowed a bit after those first two fish but we did have several stretches where we lit them up. Brad got em’ on the D & D’s and I powered through a couple of slow at-bats with the JJ Sparkle Minnow before they honed in for last light. A solid day all around with six or eight to the boat, moving another dozen or thereabouts. More bows than browns this time around but you never know what you’re going to get. Winter is typically swing season on the MO’ thanks to our friends downriver who have pretty much singlehandedly created the two hand Trout Spey craze which has done nothing but grow since I’ve been here. Kudos to Headhunters Fly Shop for creating an entirely new market on the Missouri. It’s a super effective method and an entirely different way to fish. I have yet to board that train preferring instead to stick with what I know and LOVE which is streamer fishing of the single hand variety. I prefer covering long stretches of water, fishing from the boat with big heavy lines, big bugs and stripping more than swinging though swinging certainly has its moments. Mind you I have nothing against the Trout Spey game, it’s just not my thing (as of yet). When I first came to the Missouri I was told by many that it wasn’t a great streamer river. I was told that Intermediate lines and small streamers were what was most effective and while this may be the case from a numbers standpoint I think folks are limiting themselves with that mentality. Is the Missouri a great streamer river? It depends how you define “great” but to me moving 20 fish in a day and hooking a third or more of those is pretty great. The biggest fish I ever caught on the MO’ came on a hopper but outside of that the majority of big fish I catch are caught on streamers. Will they eat big streamers? You bet. Again, you might increase your numbers fishing smaller bugs but I’m of the mindset that if you’re hunting big fish you should be running big bugs. I hooked the fish above on a #4 Sparkle Minnow. 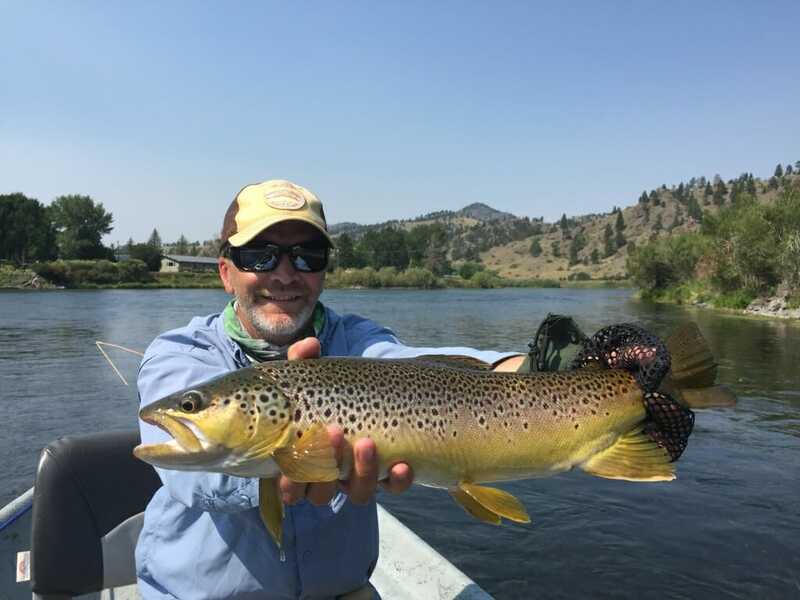 This was an average sized brown (17” give or take) already in the process of consuming about a 6” rainbow which apparently wasn’t quite enough of a meal. It’s quite possible that the majority of the diet of these fish on the MO consists of smaller leeches and bait fish but that doesn’t change the fact that they are opportunistic feeders and that they are predators. Put a big bug in front of the right fish and he’s going to eat it. The bigger the bug the bigger the fish? Not necessarily but odds are that the bigger fish are going to target the bigger meals. Sure they’ll eat the small stuff too but in my mind by running bigger bugs I’m minimizing the odds of hooking smaller fish and maximizing the odds of hooking a beast. I like to dredge and I like to hit every nook and cranny of any kind of bank structure. I like to work the buckets and the tailouts and soft edges near the bank. I like to switch up the retrieve until I find what works and to a lesser extent I like to change bugs and colors but truth be told I have my go-to bugs which seem to work more often than not and you’ll usually find I’ve got one of these half dozen or so offerings rigged and ready at any given time. That being said like most streamer junkies I’m a sucker for bugs that swim so if it darts and dives and flounders like the wounded bait fish it’s supposed to mimic I’m all over it. Don’t get me wrong. There are plenty of days they simply aren’t interested in chasing streamers and on these days you always have the option of bobber fishing but more often than not I’ll throw streamers all day long regardless if that’s what we set out to do. Who knows, maybe someday I’ll get in line with the Trout Spey set but for now there’s nowhere I’d rather be than standing in the bow of a drift boat, 7 or 8 weight in hand trying to coax monster browns up from the depths or out from the cover. I live for this. A close second however would be sitting in the rower’s seat serving up prime water to someone just as obsessed as I am with the streamer game. I will say that this is my preferred time to fish streamers. Now until the weeds return next summer is prime streamer time and while the fish may be a little on the lethargic side as the water temps drop it makes it all that much more challenging and rewarding to coax them in to attacking. Single hand, two handed, streamers, bobbers….do what you like and don’t miss out on what can sometimes be truly epic winter fishing on the Missouri. The second season is in full swing here on the Missouri on this second day of October and if the last few days are any indication we could be in for one phenomenal fall fishing season. Cloudy skies and chilly temps (with the exception of yesterday afternoon when summer made a brief return) have made for ideal conditions. The bugs are going strong and the fish are feasting. These past several days have been a DFO’s dream….a target rich environment to say the least. Those focusing their efforts below on nymphs and streamers are finding success as well. Fall is definitely among our favorite times to fish the MO’ regardless of the conditions but this fall feels like it has the potential to go down as one of the best in recent memory. We do have some interesting weather on the horizon next week with the forecast calling for snow with highs in the 30’s and lows in the 20’s. Wednesday could be challenging with a high of 31, a low of 22 and up to 3” of snow. Thursday looks roughly the same. Will winter be here to stay come next week? I wouldn’t count on it but be prepared for the elements if you’re headed out there. I hit the water a couple of days ago on a 40ish degree morning and opted for muck boots instead of waders and a flannel shirt and vest instead of a jacket. Bad call. The forecast was for highs in the mid 50’s which I’m not sure we ever saw. I didn’t bring gloves, I didn’t bring a stocking cap. Thankfully my buddy had extras. To be fair, I have piles of gloves and hats and jackets stashed in my boat so I’m used to having what I need when I need it, but on this day we were not in my boat and I didn’t do a very good job of being prepared for the elements. Being cold will rapidly ruin a good day so layer up and bring an extra pair of gloves. Err on the side of too many layers….you can always remove the ones you don’t need. Along these lines we’re stocked up in the shop with great base layers, outerwear and hats and gloves a plenty from Simms and waders and boots from Redington and Korkers. Stop by the shop for all the best cold weather gear. With the exception of the chill in the air it feels a bit like July around here right now with close to a full house all month long. We have had a few cancellations from folks who didn’t like the looks of next week’s forecast so we do have a couple of rooms available should you decide to brave the elements. We do have guides at the ready as well who’d like nothing better than to get you dialed in to fall fishing on the Missouri. Six weeks from now we’ll likely be looking back at the awesome fall season that was. Don’t let it pass you by. Give us a call and book NOW! We’re open daily 7:30 am – 5:00 pm and we invite you to come in and discover what the buzz is all about. Wolf Creek Angler is the best Missouri River Fly Shop you never knew was here. Our mission is to earn your business, one customer at a time by providing you with exceptional customer service and the quality products and services you expect from your Missouri River fly Shop. Come discover all that Wolf Creek has to offer. Not only is Wolf Creek home to THE up and coming Missouri River Fly Shop, Lodge and Guide Service, but it’s also got great dining (and drinking) options with Shotgun Annie’s and The Oasis; the best cell service for MILES AROUND; The Canyon Store which is the ONLY gas station/convenience store between Helena and Cascade and all closer to Holter Dam and Wolf Creek Bridge FAS than ANY OTHER SHOP. And speaking of Wolf Creek Bridge FAS – The FAS will be closed to the public starting tomorrow for a capital improvement project which will take approximately 30 days or less. This will definitely be an inconvenience for the time being but it sounds like we’ll soon also be closer to the NICEST and NEWEST FAS on the MO’. Here we are in the final days of September and while autumn just officially arrived last Saturday, in some ways summer seems like a very distant memory. Most mornings have been dark and chilly and while we’ve continued to have some days with temps in the 70’s the chill returns early each evening. Traffic has been steadily increasing since about the second week of September and while we’ll be winterizing rooms before we know it, we’re currently enjoying a full house more nights than not. I always enjoy the company during the fall knowing that in just six weeks or so the lonely days of the winter season will be upon us. Soon the dark winter days of the canyon will commence and the shop will be starved of sunlight until spring. In the meantime we’re loving each and every sunny day. The fishing has been good overall, though with the increase in traffic comes the increase in sub-par fishing reports. Guide reports have been good most days, DIY reports are always a mixed bag. The river is in great shape right now, holding in that 4500 CFS range with water temps in the 60 degree range and dropping. We’re getting a fair amount of folks inquiring about the flows, feeling like they are higher than normal. This isn’t really the case as indicated by this chart which shows that we are currently just a few hundred CFS over the historical average. We get a fair amount of wading anglers who prefer flows to be in the 3500 – 4000 cfs range which is great for accessing more spots but that being said, the river is VERY wadeable right now. You should always use extreme caution when wading any river but these flows are not considered dangerous. Weeds are an ever-present challenge right now, but no worse than normal. Expect to encounter them and be vigilant about keeping your rigs clean. Weeds are part of the deal this time of year on the Missouri. Don’t let them get you down and don’t expect them to disappear anytime soon. They’ll be here throughout the fall fishing season but there’s no reason to let them ruin your day. 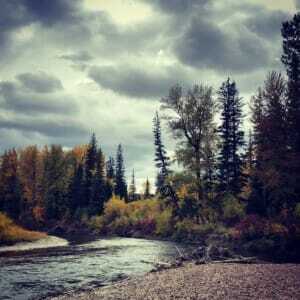 Dry fly fishing is a real possibility each day though we are in transition so expect this to improve from here on out. There have been multiple reports of BWO’s and you can expect to encounter pseudos, callibaetis and caddis as well. Terrestrials are definitely a possibility throughout the fall but we’ve all but closed the book on sub-par hopper season. Ants and beetles are still in the mix but keep your expectations low. We’re moving BWO’s front and center in the dry fly bins as we speak. Nymphing will continue to produce. No big changes on the bug menu though we’ve definitely seen a shift towards rainbow Czechs as the point fly of choice. Purple weight flies are a close second and I wouldn’t hesitate to throw a pink Amex into the mix. Trail with a black zebra or your baetis nymph of choice. If those don’t work try a soft hackle sow or a tailwater sow. More often than not it’s more of a depth issue than a bug issue but sometimes you have to throw the kitchen sink at them. It pretty much goes without saying that fall is streamer season so if that’s your thing then you should be here now! Yes, weeds complicate things but work through those issues and you’ll be rewarded. Who knows, that next cast might just miss every weed in its path and entice that 24” angry fall brown to strike. You won’t know if you don’t throw. Streamer bins are full and we’re also fully stocked with cold weather gear from base layers to hats and gloves to jackets, waders, boots and more. It’s been a busy month for guide trips and we expect October will be the same. We’ve got plenty of dates available for both the Missouri and the Blackfoot. Don’t wait any longer, autumn is here…make your fall fishing plans today. We bid a final farewell to summer this week with the official start of fall arriving Saturday. The Autumn chill has been in the air for a while now, especially in the mornings. You’ll want to layer up for sure. The late summer fishing has been outstanding these past weeks and should remain strong from here on out. On the dry fly side, Tricos are still in the mix but it’s feeling like that ship has all but sailed. Still a daily event but sporadic at best. The terrestrial game has been hit or miss this year with ants outperforming hoppers by a long shot. If you stick with the hoppers you’re bound to get an eat or two but trailing an ant has been the right call more often than not. Hopper wise we’ve had decent action on Moorish and More or Less hoppers in peach, yellow, pink and tan with none of the above consistently out-producing any of the others. You can’t go wrong with purple chubbies. They seem to out-fish the hoppers every time. Black parachute ants, sparkle ants and Blooms Stealth Ant in purple have all been effective ant options. There have been enough caddis around daily that a #16 outrigger or plain old elk hair caddis paired with your ant of choice might just make you forget all about the hopper fishing. Hoppers are definitely fun to fish and the takes are awesome but lately your hook up odds have been better with a caddis or even a plain old, tried and true parachute Adams. If you insist on fishing the bigger dries an October caddis wouldn’t be a bad call. I haven’t personally seen any bugs just yet but it’s time! Nymphing wise the Zirdle craze may finally be reaching an end. I’m not quite ready to proclaim the death of the Zirdle, I tried that once a few weeks back and was proven grossly mistaken. It has definitely slowed though and I’ve actually had a few days where we ditched it altogether. That being said, they’re still selling well and I’m fairly confident that WCA may have the most comprehensive Zirdle selection in the canyon. We’ve seen a shift towards rainbow Czechs and a return to Tailwater Sows and have also had a run on black zebra midges. Weight Flies in gold and purple have been consistently producing and Psycho Mays and LGM’s and Peep Shows are still go to options. Outliers have been October Caddis nymphs and Soft Hackle Hares Ear and PT jigs. Look for BWO Magic Flies and Split Case BWO’s to come into play sooner rather than later. The streamer brigade has been at it consistently during the low light hours and overcast days and if these past two weeks are any indication we could be in for a fantastic fall streamer season on the MO this year. Weeds have been a problem, especially in the canyon and will continue to present a real challenge throughout the fall but as we’ve said before if you know that going in and you don’t let the frustration get the best of you it goes a long way towards making your time on the water more enjoyable. It can be tedious work but it’s imperative that you keep your bugs clean (applies to dries and nymphs as well). Trout don’t like salad on their bugs. If you’re dragging weeds around you are pretty much guaranteed not to catch anything and what a shame it would be to have your perfect placement and/or perfect drift negated by weeds on your bugs. I haven’t observed a lot of streamer fishing going on out there (aside from that occurring in my boat) but judging by the abundance of empty spaces in the streamer bin it’s game on. Reinforcements are on the way and the bins will be full by the time you get here. ZK’s MK Ultra, Coffey’s Sparkle Minnow (JJ or Sculpin), Dirty Hippy in brown, ZK’s Inflated Ego, Autumn Splendor, Skiddish Smolt, Lil Kim, Circus Peanuts and D & D’s are all topping the weekly sales report for what it’s worth. Traffic is moderate and will continue to increase as we settle into our fall season. Lodging is busy through the end of October but not so busy that we can’t fit you in. Ditto for guide trips. I’d make that call sooner than later though so you don’t miss out on what could very well be the best fall fishing we’ve seen in years. Don’t miss the fall wader sale going on now at Wolf Creek Angler. 25% off all men’s and women’s waders and boots from Redington and Korkers. We’re also fully stocked with new cold weather gear from Simms and still have some great deals going on summer gear. Labor Day has come and gone. Summer Vacation is OVER. School is back in session. High School and college football are underway and NFL football returns this Sunday. Could this be the Lions’ year? Technically we’ve still got almost three weeks of summer to go but for all intents and purposes autumn has arrived. It even feels like fall today with a chilly 42 degrees this morning and a high only in the 60’s. We’ll see a return to the 80’s this week before things trend cooler again starting Saturday. As you might imagine the Tuesday after Labor Day tends to be a quiet day in the shop and on the river but it won’t be long before things fire up again as we enter what we’ve come to refer to as our “second season”. Rivaling our peak months of June and July, mid -September through mid- November offer some of the best fishing of the season. Having lost a good part of the prime time this season to high flows we’re hoping for an especially strong fall and by the looks of things we’re going to get it. Guide dates and lodging are filling quickly for late September and the first half of October. The weather will dictate what happens after that but late October and early November have been money for as long as I’ve been here. We’ll keep as much lodging open for as long as we can but as the cold begins to take hold we’ll be forced to start shutting things down, likely mid to late October. The motel units are the first to be closed and we generally keep the cabins open through Thanksgiving. Our bungalows and the shop are open year round and guides are available any and every day of the year. Epic dry fly fishing and phenomenal streamer fishing along with great nymphing opportunities define late fall on the Missouri. Crisp autumn air, BWO’s and predatory browns on the prowl make fall my favorite time to fish the MO’ and in fact my favorite time to fish period. Crowds will soon return, though not like what we see during the prime time so there is some solitude to be had out there as many turn their attention to hunting from here on out. Expect tricos to continue for the next week or two and stay focused on your pseudo as well as your hopper/terrestrial game. Caddis have been resurgent as of late and will continue to offer opportunities as we await the autumn BWO’s. Nymphers are finding success with gold or purple weight flies, Psycho Mays, LGM’s, Purple Lightning Bugs, PT’s, Peep Shows, Redemptions, Zebras, 2 Bits and the like. Claws R Cray, Snapping Crays and Zirdles continue to drive the numbers. Streamer fishing is heating up and will only get better from here on out. Low light conditions and overcast days are key but don’t feel like you can’t fish streamers in the sun. Sunny clear days may not be optimal but you never know unless you throw. There are plenty of big fish caught on streamers on sunny days. Don’t wait for perfect conditions, work with what you’ve got. Speaking of conditions, prepare yourself mentally to contend with the weeds no matter how you’re fishing. They can frustrate the best anglers out there but if you choose your water wisely and expect the inevitable it’ll go a long way in helping you maintain your sanity. Olive has been working well as have natural and tan. JJ Sparkle Minnow shines this time of year but don’t give up on the Sculpin version which seems to get it done in just about any conditions. ZK’s MK Ultra in grey or brown and yellow, Dirty Hippies, ZK’s Inflated Ego, Montana Mouthwash, Galloups Peanut Envy, Skiddish Smolt, buggers and polar leeches all good choices right now. You’ve heard it here plenty and we’ll continue to preach it…fish what you like and fish it well. Confidence in your bugs makes all the difference in the world no matter what discipline but it’s critical in the streamer game. Most are stripping, some are swinging. Cover a lot of water and bomb the banks but don’t overlook the riffles, drop offs and buckets. The fish are everywhere. Stripping off of the bank will get you your best ROI but you could definitely hit pay dirt hitting the water overlooked by most. Fish the next two weeks if you want solitude. Busy days are coming. 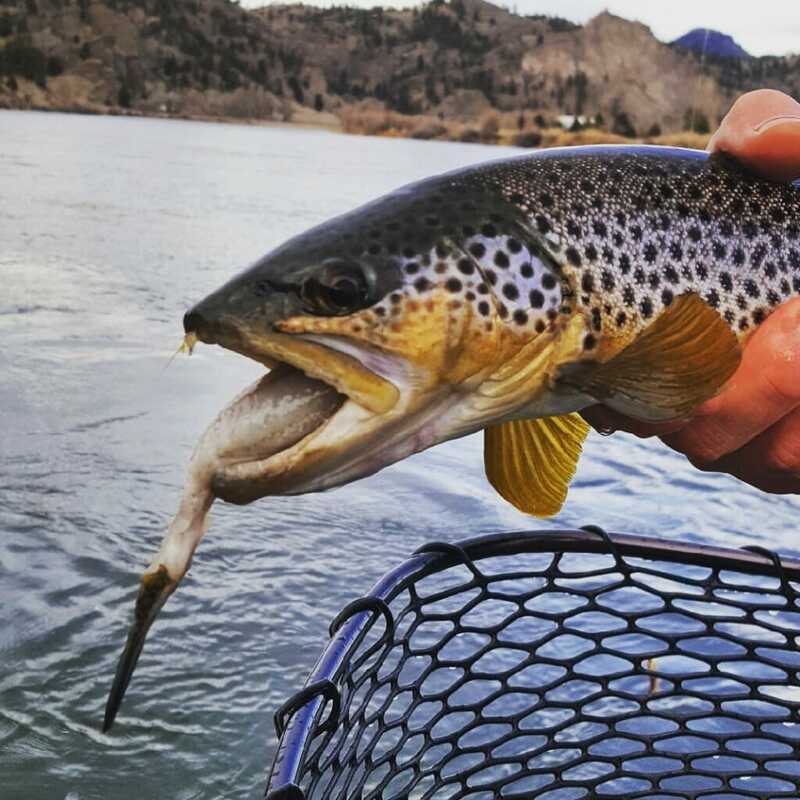 Holter Dam to Craig is still your best bet for mixing it up with nymphs and dries (emphasis on nymphs). I’d stay below Craig if it’s streamer or terrestrial action you seek. Welcome to fall on the Missouri. Be sure and pay us a visit for obscene deals on summer gear. We’re in the process of shifting to colder weather gear and will see an influx of new arrivals coming soon. 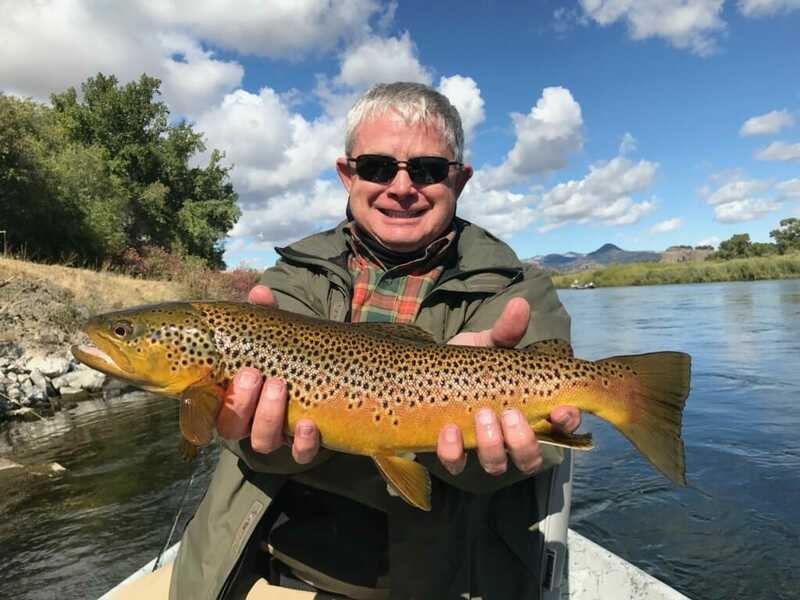 From the top guides on the river to affordable lodging to shuttles and accessories, rods and reels, lines and leaders, boots and waders and the best bug selection in the canyon we are your Missouri River one stop shop for everything autumn fly fishing. Don’t miss our Fall Wader Sale happening now. Fall is the time to drag the waders and boots back out. Why not treat yourself to an upgrade. 25% off all wading gear while it lasts. We proudly feature Redington waders and boots as well as Korkers boots which continue to dominate with interchangeable felt and rubber soles. There are always great deals to be had at Wolf Creek Angler, the best shop you never know was here. We saw a big change in the weather yesterday as temps peaked in the high 40’s before dropping into the high 30’s last night. A soaking rain and gusty north wind gave us a taste of what’s soon to come. Those who braved the elements and fished yesterday hit it just right. Lots of fish up, solid nymphing and the best streamer fishing we’ve seen since early spring. Hopefully this too is an indicator or what’s to come. Don’t put away the flip flops and sunscreen just yet. After all, we’ve still got more than three weeks of summer to go. We’ll see temps in the 70’s this week but the shorter days and the cool nights definitely have us thinking about fall fishing. The trico hatches continue to please most mornings and should last at least another couple of weeks. Terrestrial fishing has been improving and will run through mid October. And speaking of October, it won’t be long before we start seeing some October Caddis. The Zirdle has reclaimed top spot this past week in the nymphing world. We’ve had good luck with both the tan and the olive. I’m not sure the color is critical at this point. Try a Claws R Cray or a Snapping Cray as well. Black Zebra Midges at the dam and Peep Shows, S & M’s, Psycho Mays, LGM’s, Purple Lightning Bugs and Frenchies all good options as well. Medium depth, faster water running 5 – 6′ overall sans split shot has been the ticket for me but short leashing the shallows has also been productive. 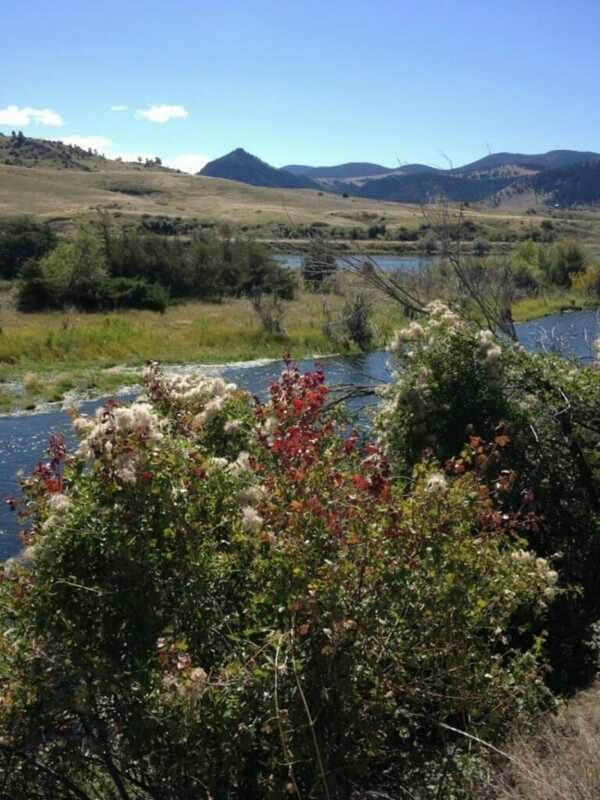 The best nymphing has been from Holter Dam to Stickney. The canyon has provided plenty of solitude and plenty of fish as well. Give the hoppers a go through the canyon, with or without a dropper. We’ve been getting looks and eats on Chubbies (purple, gold and royal) and have finally started to get some action on hoppers as well. More or Less and Moorish Hoppers in peach or tan (#10 ) should do the trick. I missed the action these last two days but as I mentioned above it sounds like the best streamer fishing of the summer….by far. Two words…. Sparkle Minnow…that’s all you need to know for now. Weeds will be a frustration whether you’re dry fly fishing, nymphing or streamer fishing. Anticipate that going in and deal with it. If you don’t come mentally prepared you could be in for a discouraging day on the MO’. As I mentioned, we’ve still got more than three weeks of summer to go but that fall feeling is definitely taking hold. School is back in session, football is about to start, archery and upland bird hunting opens Saturday, Oktoberfest beers have begun to appear on store shelves, green leaves have begun to turn to oranges and reds and yellows and you may or may not have already fired up your furnaces. Traffic is still relatively light on the river and with many switching their focus to hunting it may get even lighter for the next week or two but we’re not far from what we like to refer to as our Second Season. The shops and lodges and restaurants (and of course the river) will soon be abuzz with activity again as we close out the 2018 season. Don’t miss out on Autumn fishing on the Missouri. It’s a magical time to be here. We’re half way through the month of August and continuing to enjoy one of the finest Trico seasons in recent memory. Light traffic, and clockwork hatches with plenty of hungry targets…does it get much better? Couple these epic conditions with FREE lodging and that’s about as good as it gets. Our Dog Days of Summer Guide Trip and Lodging Special will only be around through the end of the month. Book a full day guide trip and one night of premium lodging and the second night is on us! You simply can’t afford to pass this up! How long will it last? It’s hard to say but you’d be wise to get here sooner rather than later if you want to get in on this action. Go to dry fly selections include Indicator Spinners, Hi Vis Tricos, Double Wing Tricos, Buzzballs, Hi Vis Sprouts, Drowned Tricos and Caddis favorites like Outriggers, Bloom’s Parachute, Cornfed, CDC Caddis Emergers and Front End Loaders. Nymphing has been solid as well, though much better on some days than others. Nymphing traffic has been primarily in the Holter Dam to Craig stretch with the highest concentration of boats in the grass flats…tis the season! Even so, it’s far from overcrowded and if you’re willing to work some of the sneakier runs you can have it all to yourself (and still catch a bunch of fish). We’ve been doing well with the Peep Show/Black Zebra combo near the dam and also getting them pretty consistently on Frenchies and Little Green Machines. Red Headed Step Child, Military May, Tailwater Sows, Psycho Mays, Purple Lighting Bugs and PT’s are all good options as are Zirdles and Snapping Crays, especially in the Wolf Creek to Craig run. All of these and many more available now in the well-stocked bins at Wolf Creek Angler. Hoppers and ants should be a part of your August dry fly arsenal as well. I’ve yet to have a stellar day with the big bugs this season but if you stick with it you should be able to at least move a few fish…especially from Craig down. Work them tight to the banks and don’t overlook the mid-river riffles. I’ve caught some of my best hopper fish in mid-river randomness. Throw anywhere and everywhere. The fish don’t live by our rules of where they should or should not be. Streamer fishing has likely reached the point of diminishing returns for most anglers with the amount of aquatic vegetation currently in the system but that being said, I would never shy away from it, particularly on the rare overcast days. Book your fall dates now while there’s still time and stop in for great deals store wide on summer sportswear and more. Come out and experience the best dry fly fishing of the season and while you’re at it take advantage of the best deals of the season on great gear from the best brands in the industry. PMD’s are what’s on the menu. Stop by Wolf Creek Angler for the widest selection of Missouri River flies ever assembled under one roof in Wolf Creek Montana. The folks at the Bureau of Reclamation have made good on their promise to decrease flows, so much so that we’re currently sitting at 12,000 CFS. 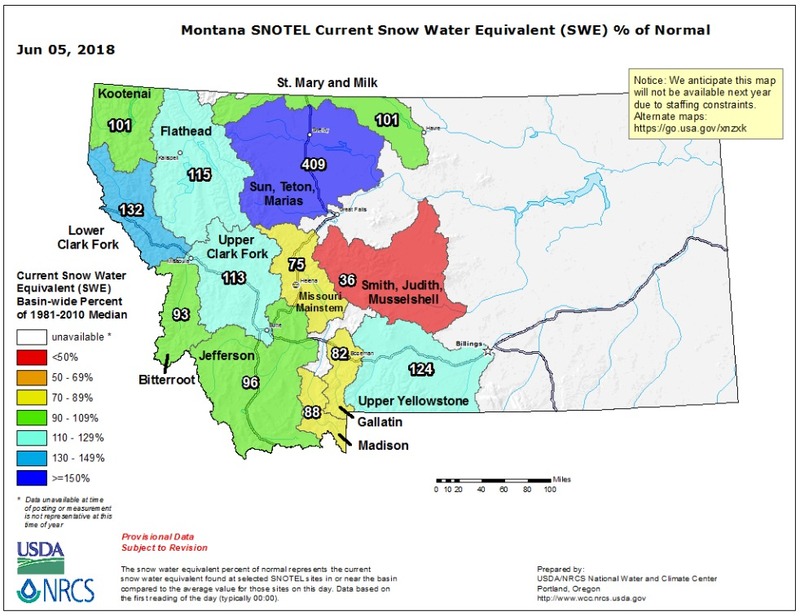 Remember it was just one week ago that we were bumping up against 20,000 CFS. 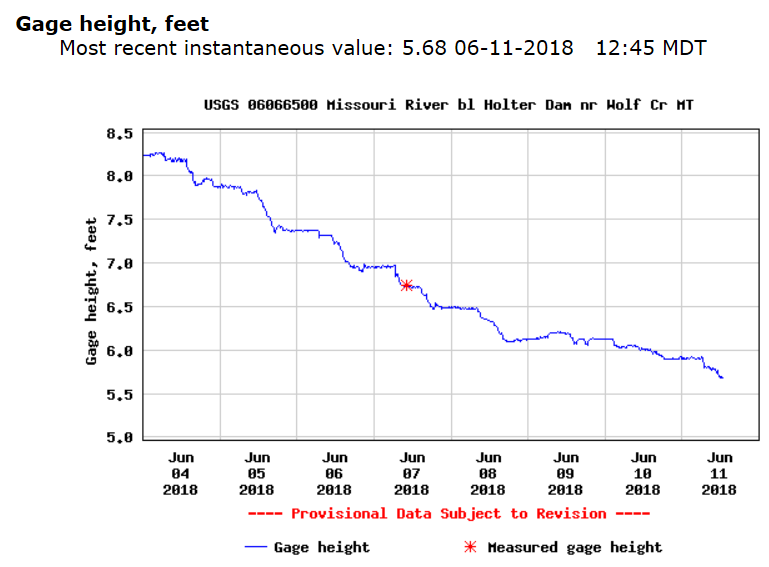 A significant drop to say the least and one which has brought us the return of drift boat rentals (including the Project Healing Waters boat as of now) and a renewed optimism following a tough month of big flows and a lot of phone and email conversations having to do with high water. 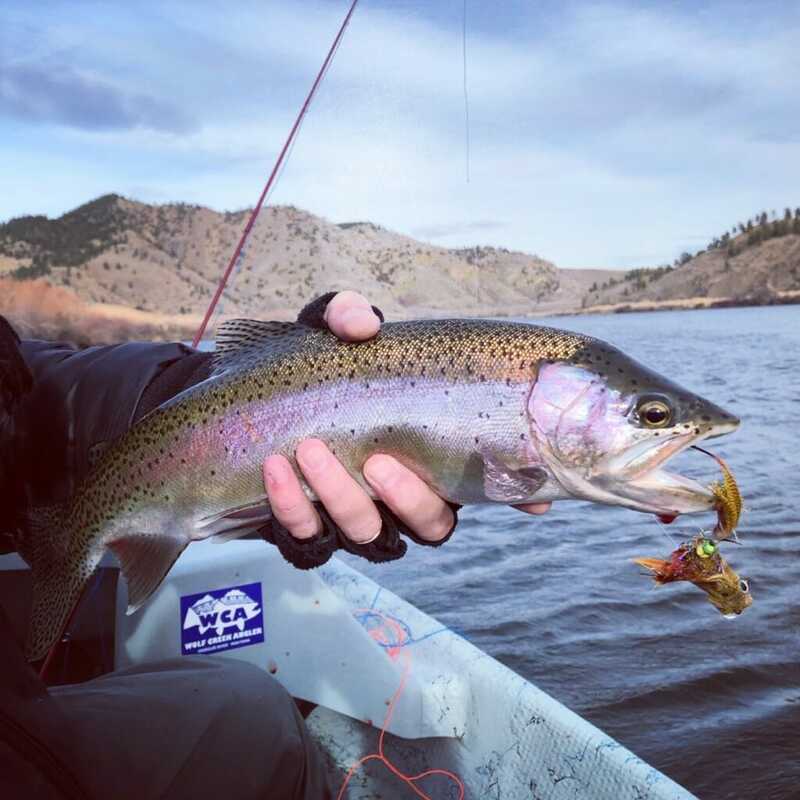 The fish have begun to expand their diets to include the abundant PMD nymphs now mixed in with the sowbug smorgasbord which defined spring fishing in 2018. PMD’s are hatching and dry fly fishing, while still a long way from prime, is becoming a real possibility with each drop in the flows and each passing day. We’re just over a week out from the Summer Solstice….the longest day of the year which, consequently, means that, depressing as it may be, the countdown to winter will soon be underway. The clock is ticking on your 2018 season. Traditionally we are in the thick of the grind by this point in the season but it seems the grind will be delayed this year. Don’t get me wrong, things are abuzz at WCA. Our lodging is running near capacity as you would expect in June and we’ve been busy in the shop most mornings and have been nearly overrun on more than a couple of occasions. All that being said, things seem a little quiet on the MO’. There are definitely folks around but there hasn’t been much waiting at the boat ramps and you can usually find a table or at least a seat at the bar on any given night at all of our local watering holes and restaurants. This isn’t typically the case in June. It’s true that other waters around the state are coming into shape so that could account for some of it but for whatever reason traffic is down so you couldn’t ask for a better opportunity to come out and enjoy a bit of relative solitude on what is arguably one of the best fisheries in the country, if not the world. The forecast looks good for dry fly fishing to improve daily. There are bugs hatching and the fish are starting to key on them. PMD’s and Caddis are the game and the long- dormant dry fly bin has finally started to get some attention. Some suggestions for your dry fly arsenal…. PMD’s – Snowshoe Emerger, Greg’s Para Emerger, Nyman’s DOA Cripple PMD, Helen Keller PMD, PMD Flash Cripple, Brooks’s Sprout PMD, Hi Vis PMD, Rusty Spinner. Caddis – Blooms Para Caddis, Outrigger Caddis, CDC Caddis Emerger, Jake’s Hi Vis Caddis, Cornfed Caddis, Front End Loader. Essentials – Parachute Adams, WCA Trude, Purple Haze, Rocky Mountain Mint, Blooms Stealth Ant, Cinnamon Flying Ants, Buzzball. Still chasing bobbers? Try tailwater sows, Split Case PMD’s, PMD and Rusty Magic Fly, PMD Redemption, Psycho May, S & M, Wondernymph, Weight Fly (purple or gold), UV Czech Caddis, Nitro Caddis Pupa, Tung Dart, Peep Show, PT’s , Lightning Bug (purple), Zirdle. Streamer fishing seems to have fallen off a bit but with the water on the drop there’s an abundance of water back in play which had been negated by the higher flows. 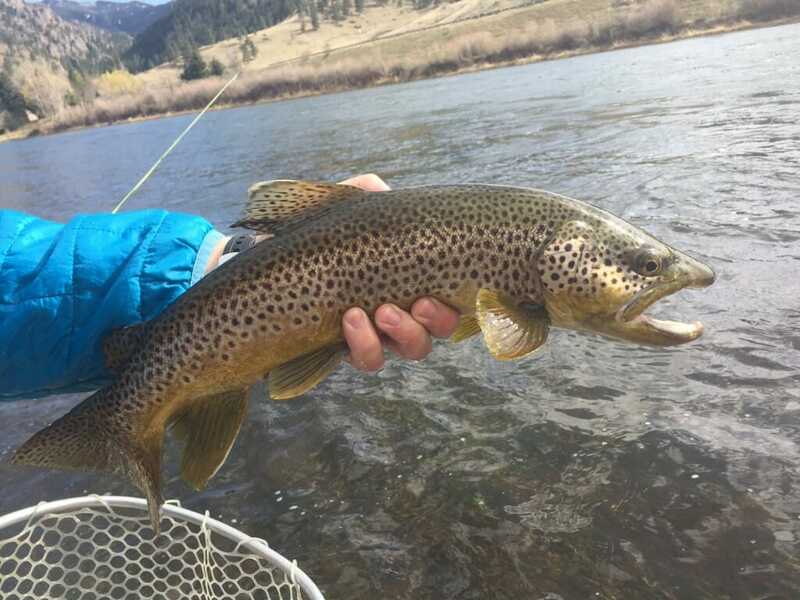 Many have moved on from streamers considering dry fly fishing is a real option so it’s an excellent opportunity to hit those spots you’ve been waiting all spring for. Sparkle Minnows, MK Ultras, Dirty Hippies, Circus Peanuts, D & D’s, Gongas, Dungeons….throw the ones you like, the fish like them too. 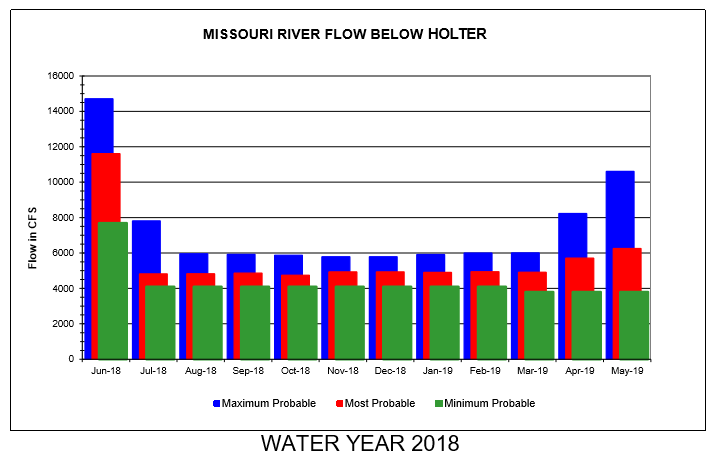 The water is expected to continue to drop barring any extended precipitation events and if the most probable outlook shown below comes to fruition we’re in for an awesome season with near perfect water conditions. The water is dropping, the sun is shining, the bugs are hatching, the fish are eating…life is good on the Missouri. We hope you’ll join us for Prime Time on the Missouri River. 2018 has proven to be a new experience for me in the world of Missouri River Fly Fishing. 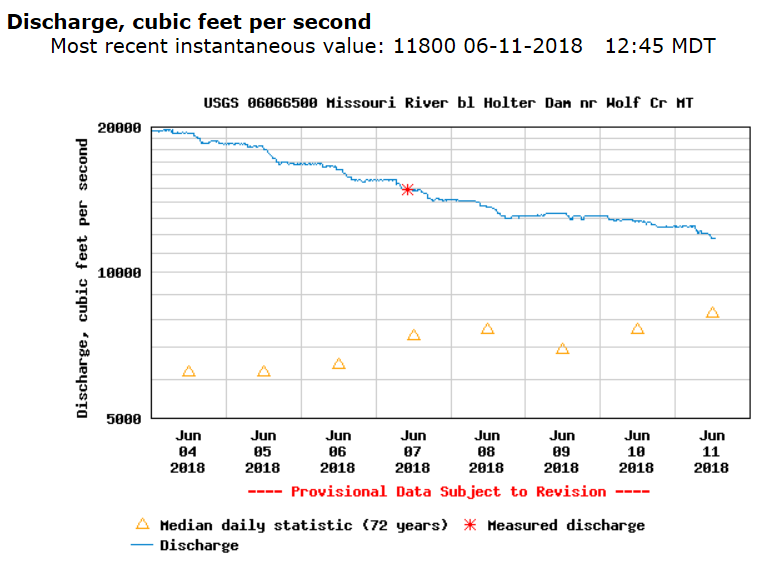 Higher than average flows have presented challenges we’ve not had to deal with thus far at Wolf Creek Angler. Not really fishing challenges mind you but shop challenges which require a bit more creativity and finesse and faith. The high water fishing challenges are easy. Longer rigs and more split shot make the world go round. That doesn’t do much for the Dry Fly crowd but they’ll get theirs soon enough. The flows will come down and the dry fly fishing will happen but it’s the promise of the future that really has us stoked following the scouring we’ve gotten this spring. Flushing Flows for sure! Unfortunately shop challenges are not as easily met. We’ve muddled through however and it feels like the worst is behind us. Sure we’re still getting plenty of calls about the flows and we’re still having to have the unpleasant discussions pertaining to cancellations but as of yesterday it’s all starting to feel better. Pair this with the return of a full house of lodging and some very busy mornings in the shop and everything seems right with the world again. 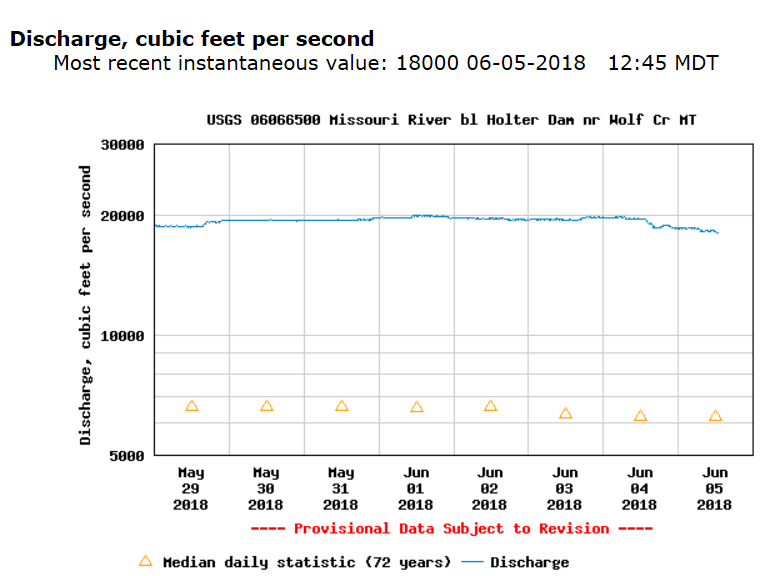 Granted we may see some precipitation which could slow the drop in flows but yesterday’s notice from the Bureau of Reclamation that the peak inflow into Canyon Ferry Reservoir from the snowmelt runoff has occurred in the Upper Missouri Basin was sweet music to our ears. Yesterday’s 1000 CFS drop will be followed by another 1000 by tomorrow afternoon. It’s doubtful they’ll continue with such drastic decreases but it’s definitely on the drop and we will keep you posted on what we’re hearing is coming. The fog of high water trauma has lifted. I can’t help but think that we’ll be renting out drift boats again soon (15,000 cfs) and look for the Project Healing Waters boat to be available before long as well (12,000 cfs). As you would expect, the big drops tend to have a temporary adverse effect on the fishing which has been widely reported as off the charts as of late but which slowed a bit yesterday. Obviously nymphing is going to continue to be the game for the time being but that dry fly light at the end of the tunnel you see…that’s PMD’s coming soon! Accordingly you should start adding PMD nymphs to your arsenal. We like the PMD Magic Fly, Split Case, Crack Back, PMD Wondernymphs, Doc’s PMD, Superflash PMD’s and PMD S & M’s (amongst many more). Worms and sows are still the staple and will be for the near future but we would definitely recommend getting some mayfly nymphs in the mix. Green Machines, Psychomays and PT’s could be the ticket. As the flows recede you could do worse things than throw a streamer. Heavy sink is the key for the time being. Get it down fast and give it some life. The target zones will begin to expand and if you hit it on the right day (preferably overcast) you may just stumble into some excellent streamer fishing over these next couple of weeks. Olives, whites, naturals, black…..try the ones you like and see what happens. Rooms and guides will be a little harder to come by from here on out but there’s been enough shuffling of the schedule that you’ve still got a good shot at both so give us a call today to book your Missouri River fly fishing trip of a lifetime. Stop by the shop on your way to the river for everything you need for your day on the water. Shuttles, ice, licenses, sun protection, wading gear, rods, reels, rain gear, tools and accessories, lines, leaders and tippet a plenty, tons of split shot and of course the largest selection of bugs ever assembled under one roof in Wolf Creek Montana. 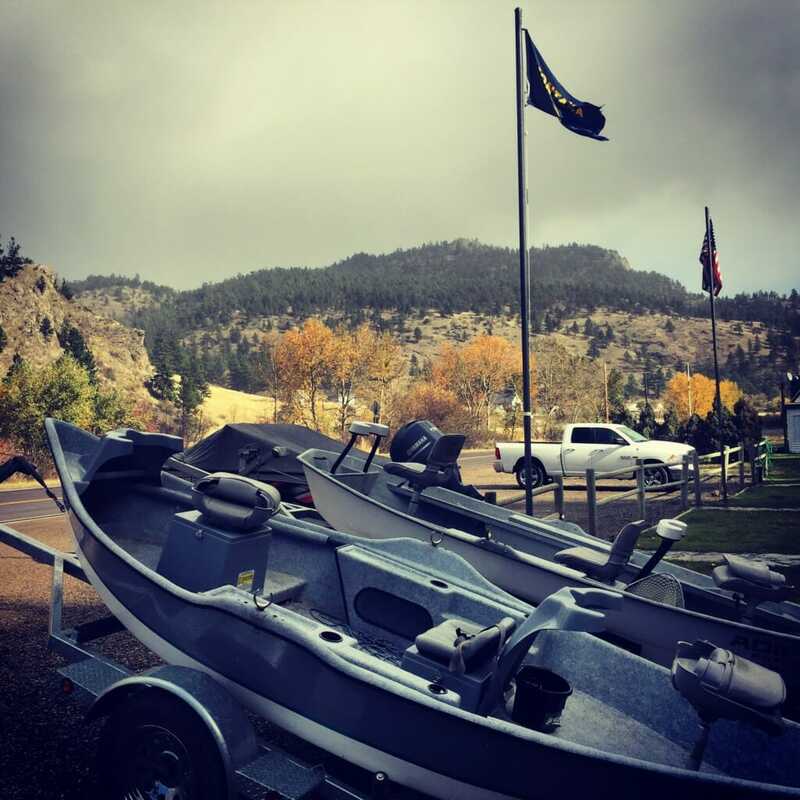 We hope you stop in no matter where your are fishing but if you’re starting at Holter Dam or Wolf Creek Bridge you’d be foolish to go anywhere else. We are closer to these launch sights than any other shop. Come discover the best Missouri River Fly Shop you never knew was here.